The opening sequence of this film makes the new version of The Hills Have Eyes resemble Bambi. It must have the hardest-hitting first five minutes I've seen in a movie for a long time. A car hitting a deer in the middle of the road and covering the windscreen in thick red blood; a man with half of his head missing; and a whining dog dragging the rump where its back legs had so recently been (don't worry, if you check out the photo gallery you'll see that the dog normally wears a harness, pulls itself along on wheels and looks perfectly happy). I wondered if this could be one of those rare breeds that kicks the horror genre into a new and original direction every so often. Unfortunately, it soon regresses into a formulaic pattern. The characters are typical of any teen horror flick. There's the sensible one, the party-loving animal, the dangerous one, the cool dude, and the disabled (blind) one. Although this could be a cross-section of teen society, it does seem rather forced here. The wait-until-the-end-for-everything-to-make-sense inverted plot is not exactly common place, but it has been used several times since The Sixth Sense. For the format: take a large portion of Dead End (one of those genre-turning films I mentioned earlier), add Jason from the Friday the 13th films, sprinkle on Final Destination and stir vigorously. 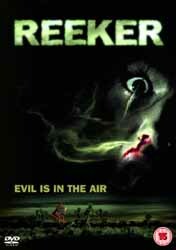 Having pointed out its shortcomings, however, I must make it clear that Reeker is far from being a bad movie. There are several enjoyable elements, including the Reeker itself, which is particularly well realised - although, considering the reveal of the ending, I still didn't fully understand its affinity for power tools. Perhaps it tied-in with the manner of deaths at the end. As an added bonus even Michael Ironside doesn't play the expected villain. So, in conclusion, a better than average horror offering from a new writer/director (which is always to be encouraged), but hardly original. Special features include a commentary with cast and crew; a Making of Reeker featurette (11 mins); a Teaser Trailer; Photo Gallery; Cast & Crew Biographies; and Trailers for other releases. On a final note, the end credits carry this message: "If you're a film reviewer and you're uninspired enough to use the phrase "This movie stinks" or any other lame pun/riff on the title - ha ha ha." I'd just like to say I'd never reduce myself to using such crass remarks. There's a better class of reviewer at Sci-fi-online (ahem). The director's gone and upset me now... sniff. Oops!